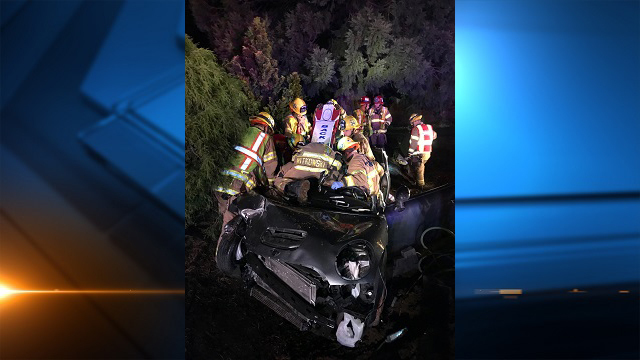 PORTLAND, Ore. (KOIN) -- At least one person was hurt in a crash involving multiple cars Tuesday night in Tualatin, firefighters said. TVF&R responded to the crash shortly after 10 p.m. on Southwest 65th Avenue between Southwest Norwood Road and Meridian Road. Crews extricated one person from a car involved in the crash, officials said. It wasn't immediately clear how many people were hurt or how badly. Both directions of 65th Avenue were temporarily closed while crews worked to clear the scene. Deputies with the Washington County Sheriff's Office launched an investigation into the cause of the crash. Firefighters are currently responding to an injury crash w/ multiple vehicles involved on 65th Ave between Norwood & Meridian in Tualatin. One patient is being extricated. 65th Avenue is closed in both directions. Please avoid the area. @WCSOOregon and @TualatinPolice assisting.